It all seems such a blur so far. 11 Days into the trip and I am just now starting to write my travel tales. Perhaps that is a sign of enjoying my time. Trip number 11 to Thailand started in its usual way. One difference was the direct Denver to Tokyo flight. Otherwise, the arrival in Bangkok at almost midnight, welcomed by heat and humidity, the trip to Floral Shire Resort, the room on the second floor, was all the same. The restaurants on the way to the hotel were once again full of people, a contrast to the last time I was here and the curfew was in effect. The other distinct difference was knocking my computer off the table in the morning when grabbing for my phone to silence the rather loud alarm, made even louder by the tile floor and concrete walls. Much like bread landing butter side down, the computer landed on the side where the power cord is plugged in. The result, the DC connector was jammed into the computer and could no longer be connected to a power supply. Apparently I needed to have something interesting at the start of the trip. Getting to Sukhothai was even more hassle free than I could have asked for. Last trip I had attempted without much success at finding the free shuttle between Svuarnbhumi Airport (the international airport) and Don Muang Airport (the domestic airport). Finding the correct desk (located on floor 2 at gate 3) this time, I showed them my flight reservation they stamped the paper and I boarded the bus. Most my time on the bus was spent reading with an occasional glance at the humid haze enshrouded city and the traffic. An hour later I was at Don Muang Airport with plenty of time to kill before checking in for my flight to Phitsanulok, about 58 km southeast of Sukhothai. Aging Don Muang Airport is such a contrast to the newer Svuarnabhumi Airport. The opening of one of my favorite books, Long Dark Tea Time of the Soul, is “It can hardly be a coincidence that no language has ever come up with the phrase ‘as pretty as an airport’.” Don Muang Airport is a case in point. The dingy fluorescent light emphasizing the aging carpet and 1960’s tile floor. The crazy and unique thing about Don Muang Airport is the fact that there is a golf course situated between the two runways. Led me to wonder if the planes ever are hit by golf balls that are shanked off the course. Immediately after checking into my room, I rented a motorbike and was on my way to the old town, about 14 km from the new town. The first few meters were used to successfully get my motorbike skills up to date, all without incident. After that I was zipping through the Thai countryside in the late afternoon sun. In 2011 I had visited Sukhothai with my friends Lek, Lauren and Fern. The trip had an incredibly frenzied pace due to a late start to drive to Sukhothai (about an hour) and the need to have Lauren and Fern back to the Phitsanulok Airport in time for their flight. Our time at the ruins was spent running up and looking and taking pictures, running back to the car, zipping to the next wat ruin, running up and looking and taking pictures. This visit took on a much more leisurely pace. Probably should have considered taking the audio tour, as that might have made viewing the ruins a little more interesting. Arriving in late afternoon about 4:30, I stayed until well after dusk. Watching the light change as the sun was casting its last bit of light on the ruins was stunning. 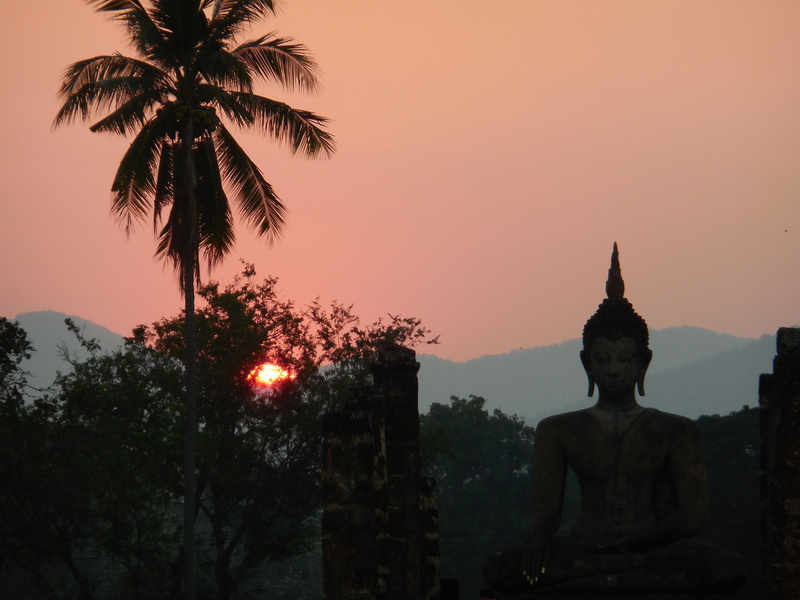 Especially seeing the evening star positioned just over the shoulder of the enormous Buddha at Wat Mahathat in the fading blue sky touched with strands of orange and pink over the distant hills. Having already spent several hours at the central zone, I opted to visit the west zone located about 5 km west of the main gate. The main feature of the west zone is a very large standing Buddha at the hilltop temple of Wat Saphan Hin, which means “stone bridge”. 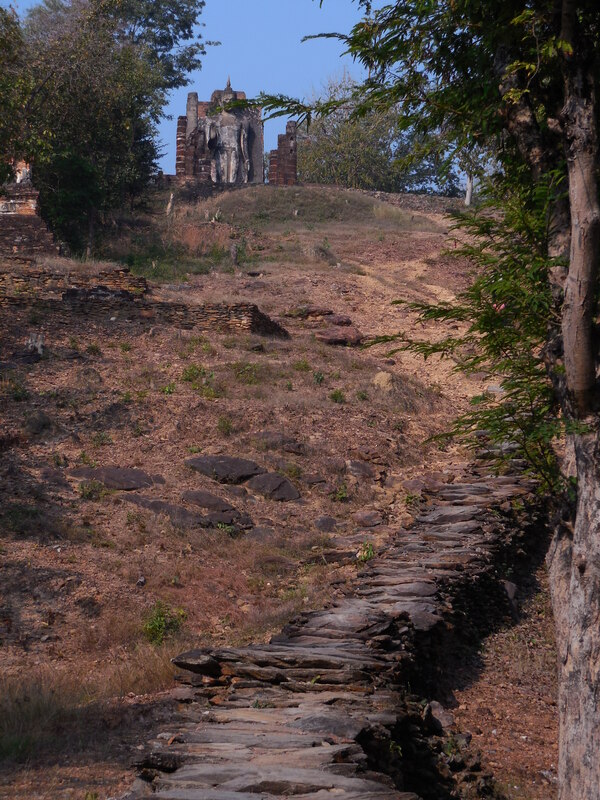 The hilltop temple is reached via a steep 200-meter long path of stone slabs. Fairly uneven stone slabs at that. The view enjoyed by the standing Buddha was worth the climb. Opted to continue further into the west zone to ensure I got my whole value out of the 120 baht (about $4) entrance fee. Some of the ruins I just looked at from my motorbike and took the occasional picture. On the ones with a more interesting description, I hiked up a few more uneven stone paths in the hopes that there might be more Buddha images and something interesting to see. Unfortunately most of the Buddha images from this zone have been moved to the museum in the central zone, leaving it to your imagination to picture what the temple looked like. To be honest, I can only look at so many piles of rocks that were once wats and chedis before I lose interest. Upon reaching that point, I turned my motorbike around and headed back toward the new town. Not to mention hunger was setting in. With time to spare after eating I opted to get a massage to work out all the kinks in my muscles from about 3 days of traveling. Buses make the 45-60 minute trip from Sukhothai to Phitsanulok about every hour. What I did not know is that there are options of buses to take. Failing to figure this out, I ended up on the slow government bus that seemed to stop almost everywhere stretching out the ride to almost 90 minutes. Getting close to Phitsanulok, the bus became more crowded. Fortunately no one really opts to sit by the farang (foreigner) unless there is no other spot to sit. Next stop on the trip was Tapan Hin, about an hour south of Phitsanulok in the Pichit province. Every trip that I can make it to Tapan Hin to visit my family, I do. I go out of my way to get there and they go out of their way to make sure that I am happy. Mostly that care and love on their part is demonstrated through their worry. They worry that I’m hungry, that I’m sick, that I can’t eat something, that I’m bored. And it is hard to convince them otherwise. I really am ok just being with them. I know the worry about me being sick part is justified, as the last two times I was there I got sick. And there was the whole ant attack thing the last trip. The whole family greats me with warm smiles and the sensation that I belong as part of them. Nun (my little sister) and her boyfriend Not were home from University. The few days I spent with them was Nun’s chance to really practice her English. Nat had to work both days that I was there proctoring a district test, so Nun was left in charge of translating for me. Translating is a trying task and I am grateful for her being there. Something is to be said for technology aiding communication. My conversations were greatly enhanced with the help of the Google Translate app downloaded to my phone. While Google Translate isn’t perfect and sometimes can be quite interesting in its translations, it was good enough. Instead of rudimentary conversation, I was able to share more complex thoughts. And using the app was much faster than trying to find individual words in my English-Thai dictionary. I still believe that any farang left on their own in Thailand will lose weight. Any farang that is with a Thai family will gain weight. The entire morning was spent eating. First breakfast. Then one of the many neighbors or family showed up with fried bananas. Then dad went and bought fried potato balls, fried taro balls, fried balls with mung beans in them, fried donut like things with carmalized sugar on them, pomello and papaya. I think I spent all morning eating. And consequently, was not hungry at lunch time when Dad was supposed to take me for pad thai. Thinking that I was completely bored, Fern (one of the neighbors) was enlisted to take Nun, Not and me to see some temples. The first temple we went to was in Tapan Hin, the extremely large Buddha rising above the temple walls looking out over the town. Here we made an offering of a candle, flowers and rubbing gold leaf on the Buddha. After a few pictures, we headed over to the train station to pick up my friend Mai. She was getting ready to go back to the University where she teaches and had a little time to spend with us. It was great to see Mai. Last time I saw Mai was almost 3 years ago. The next temple we visited was Wat Mai Kahm Wan, located about half way between Tapan Hin and Pichit. The main bot (temple building) was an awesome spectacle. Covered almost entirely in silver mirrors it glistened in the bright sun. 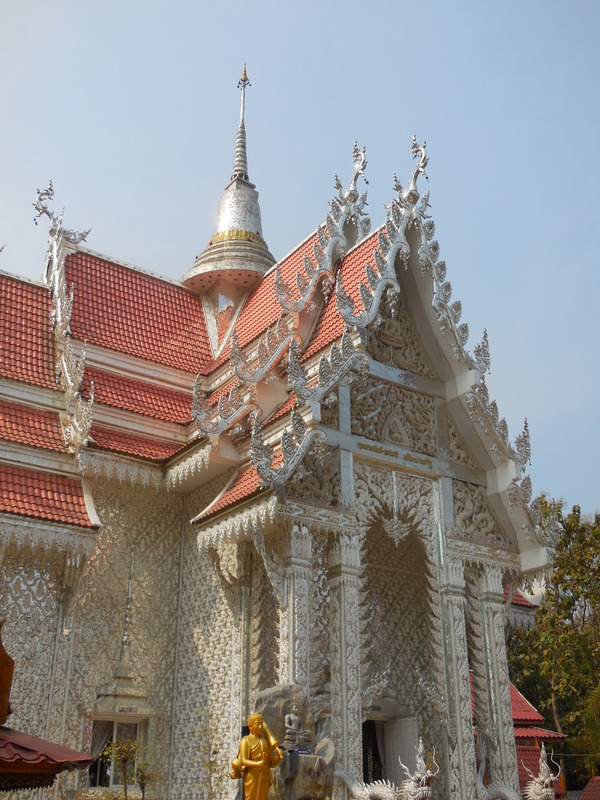 Even the inside is covered in silver mirrors, reflecting the gold of the Buddha statues. The next shrine was dedicated to yakkha, the Black Buddha. Yakkha is a mara (basically a demon), typically portrayed as eating the moon. The tale goes that each month he eats the moon but because he is unable to digest food, the moon reappears every 28 days. At the shrine, the incense and the offering candles are black instead of the typical gold. While pausing to look at the shrine and the wax offerings next to the shrine, an elderly man came up and showed us what to do to make a wax token. First, you take a piece of wax and put it in the large pot of melted wax. From there, you find the mould for corresponding to your Chinese zodiac year (I am the year of the dog), take a ladle of wax and pour it into the mould. Lastly, you take one of the already made wax tokens and offer it to the Buddha corresponding to your Chinese zodiac year. The last building at the wat that we visited was unique. A different elderly man urged us to go in for a monk’s blessing. The entrance of the building is as though you are walking into the mouth of yakkha. There you pray to the first Buddha, then move over to where the monk is sitting for the blessing. The first thing the monk does is give you a blessing bracelet. Because monks cannot had anything to or take anything from a female, he drops them in our hands for us to put on. Unlike other temples where the blessing bracelet is a multi-strand string, this temple’s bracelets are more like a true bracelet made of pink and white braided cord with a wooden bead. After the blessing, one more prayer to another Buddha and exit out of a different door than you came in. The last several trips to Thailand I have been invited to go to eat mugata. Literally pork pan, the food is cooked at the table with a heated metal plate in the center with a trough of broth for cooking the vegetables. The communal cooking is fun and brings the group together. When Nat told me we were having mugata for dinner, I was super happy. Not just because I was looking forward to eating it but because I was hoping that I would have the opportunity to have it on this trip. Nat was home when we returned from our temple tour, so Nat, Gao, Nun, Not, Name and I all piled in the car and headed off to shop for the ingredients for mugata. First stop was Tesco-Lotus to get the pork and some of the meats that were better to get there instead of the fresh market. Next was the fresh market. Nat and I mostly just walked around and talked while everyone else did the shopping. We decided we are much better at carrying things instead of buying things. One final stop at Big C for items that apparently were not at either of the other two stops. Preparation commenced the minute we got home. Nat gave me a knife and a cutting board. Then it was decided that perhaps a better task for me would be to take the small sausages out of their casings. A simple task with less possibility of cutting myself, and probably much easier to explain what needed to be done. So pork was cut into pieces and seasoned, vegetables were prepared, sausages and faux crab unwrapped. Dad set to getting the pans ready to cook, one electric and one over the fire. Mugata is one of those meals where you are constantly eating bite by bite. Everyone puts meat on the cooking plate and vegetables are added to the broth to cook. When the food is ready, which was demonstrated to me what was done and what was not done several times, you dip it in the green or the red (or a combination of the two) sauces and eat it. Repeat this process over and over again until you are beyond full. At which point, everyone will still encourage you to eat more. After dinner we headed into Pichit for a festival that was taking place. I still have no idea the name of the festival or exactly what it is commemorating. Pichit is the home of the long boat races held every year around Buddhist lent. 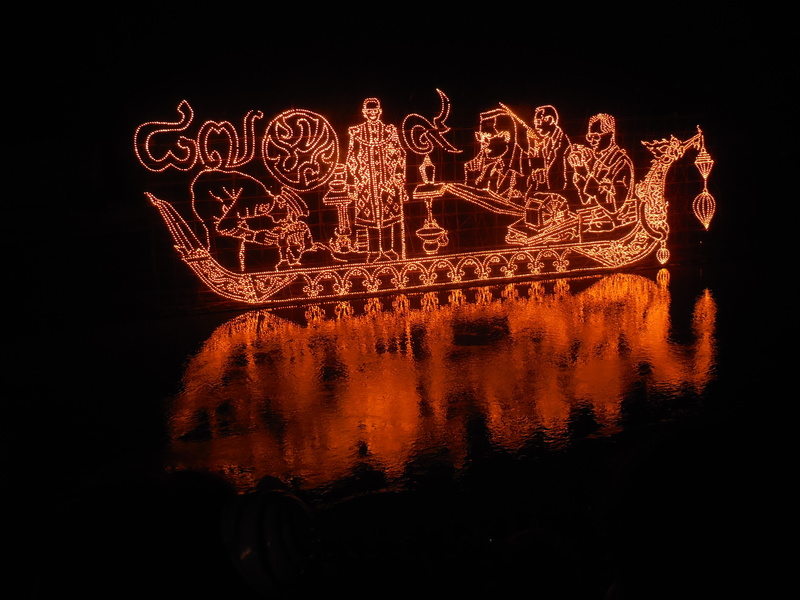 For this festival, large boat structures are constructed in the river and covered in lights so they look like they are alit with fire. The temple is a swarm of people, taking on the atmosphere of a carnival with lights and vendors. Traffic approaching the temple was a nightmare and fortunately Nat grew up close to there so knew his way around the small sois. First stop is the lottery. Like a carnival game, you buy tickets then go to the large pool of water and fish out as many small containers as you have tickets using a net attached to a long pole. Inside the little containers are numbers. When you have your allotted number of containers, you proceed to the table where workers open them, and like reading tea leaves, determine what you have won. Everyone hopes for the big prizes. I won a collection of plastic baskets, a multi-purpose can/bottle/I don’t know what opener, a bar of soap and a package of laundry soap. I kept the soap and laundry soap and left the rest for the family. The crowd was so large it was impossible to see the performances and the only pictures I was able to get were the ones where I hold my camera as high as possible, aim it at where I think it will take a picture and then see how it turns out. We did get to see the last part of the processional of women and men dressed in beautiful outfits. The emerald Buddha, typically housed in the temple, was out on display. People made offerings of candles that were floated on the large containers of water. In the background, the white temple was lit with ever changing colors. Was a very ethereal experience, especially as all commotion stopped as a blessing was made over the PA system. 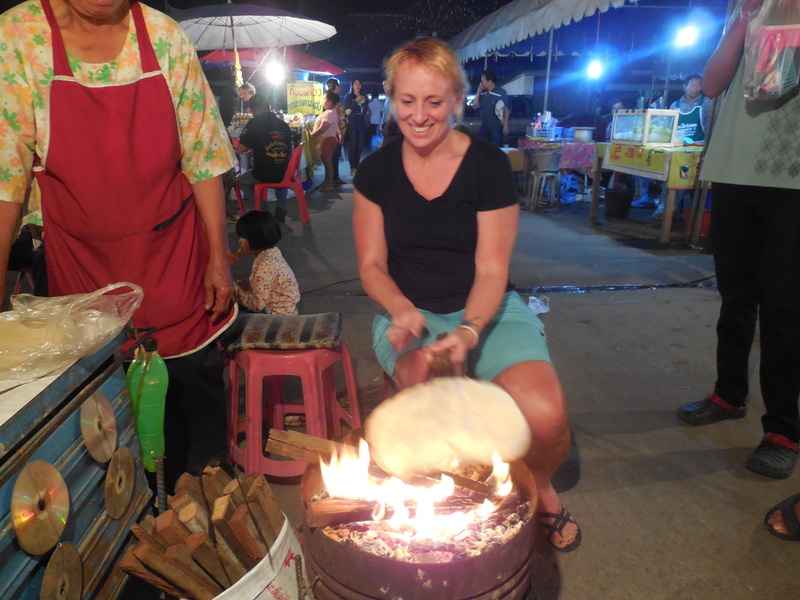 One of the treats of northern Thailand are dried rice sheets that have been moistened with sugar water and then cooked over a fire so they puff up, resulting in a sweet treat. The cooking method is the most tricky part. Two wooden tools that look like forks that have been flattened are used to quickly flip the rice sheet back and forth over the fire until it puffs up to the appropriate size. Sounds easy, right? Nat made an agreement with the woman doing the cooking to let me give it a go. Cooking this treat definitely takes a certain skill set that I’m not sure I have. Really I think that I did alright. I didn’t drop it in the fire, even though it came close occasionally, and I didn’t burn it. The festival evening was rounded out with fireworks. I love fireworks. Especially fireworks that are set off over a river. The reflection of the burst of light on the water and the amplified echo of the percussion make it even more spectacular. Perhaps I was more enthralled with the fireworks than the rest of the family, so they patiently waited while I watched them to the very end of the display. Last visit to my family, I was asked to make a western meal. Somehow I managed to pull off spaghetti that actually tasted pretty good (better than the local restaurant according to my family.) This time I decided to try and bring something that maybe they didn’t have in Thailand. So I brought popcorn, only to find out that they have popcorn here. Typically they have microwave popcorn, so at least it was something different to see how to cook it in a pan over a fire. Cooking it over an actual fire is a bit of a slow process. Holding the pan over the fire is even more challenging. Somehow I managed to pull off a perfect pot of popcorn without burning the popcorn or myself. Everyone said it tasted better than the usual popcorn that they have. After awhile one of the guys decided to give popping popcorn a try. He had more difficulty trying to hold the pot and keeping it moving so that the popcorn didn’t burn. Because he kept stopping and eventually Nat took over the process, the second batch didn’t turn out quite as well. Everyone still had fun though! Because I needed to get to Chiang Mai at a reasonable time Sunday evening and wanted to maximize my time in Tapan Hin, I decided to fly instead of taking the bus. Yes, it costs more, but it is worth it. Unlike the time I took the bus and we were running late making it to the bus station minutes before the bus left, I was under more pressure to get to the airport in time to check in. I tried to not feel stressed as I was watching the minutes pass on the clock, getting ever closer to the time we needed to leave. Because Nat was at work, we were waiting for Dad to get home so he could drive me. Finally I couldn’t take it any longer, so we piled into Nat’s car and mom started the trip to the airport. About 30 kilometers from Phitsanulok, dad caught up with us. I should preface this part that Dad drives an ambulance for a living. So we pulled over, dad and mom switched cars and off we went. On the way, dad tried to explain that he was an ambulance driver and very good at driving safely and quickly. Really I wasn’t scared. Took a sharp breath of air in one time when we were a little close to a car in front of us or passing a car making the two-lane road into a three-lane road. The important thing is that we made it to the airport and I got checked in on time.